Neuronostics is a newly established spin-out company, focussed on developing products for enhancing the lives of people with epilepsy or suspected epilepsy. Our first product – #BioEP – is a novel, patent-pending, technology for assessing susceptibility to seizures that can enhance diagnosis and prognosis of epilepsies. Our research partners at the University of Exeter have successfully trialled BioEP in retrospective studies of people with both generalised and focal epilepsies. Now with financial support from Innovate UK we are developing a commercial prototype whose efficacy will be validated in a much larger cohort. 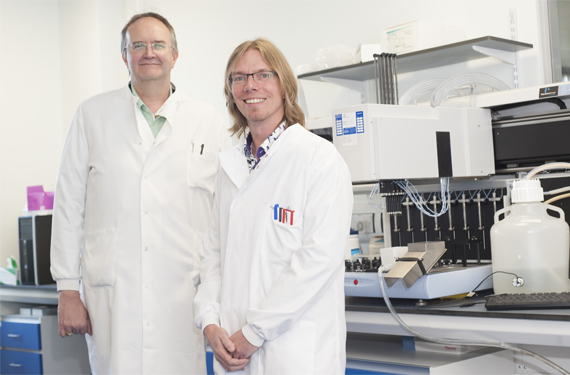 Neuronostics is co-founded by Professor John Terry (Director of the EPSRC Centre for Predictive Modelling in Healthcare) and Dr Wessel Woldman (MRC Research Fellow). Their research is focussed on the development and application of mathematical and computational methodologies for understanding the dynamics of biomedical systems, with particular interests in the transitions between healthy and unhealthy states in the human brain. Having initiated the commercial development of this technology, Neuronostics is now encouraging enquiries from pharmaceutical companies, EEG hardware and software companies and the manufacturers of electrode caps, who would like to explore the possibility of partnering with the company in the development of BioEP as a companion diagnostic/prognostic tool or potentially incorporating the technology in their own EEG hardware or software products. Professor John Terry (right), founder of Neuronostics, Director of the EPSRC Centre for Predictive Modelling in Healthcare, and Associate Director of the University of Exeter’s Living Systems Institute. Find out more about Professor John Terry.